Dominic's Journey, Mom's Journal: Generalization!!!! 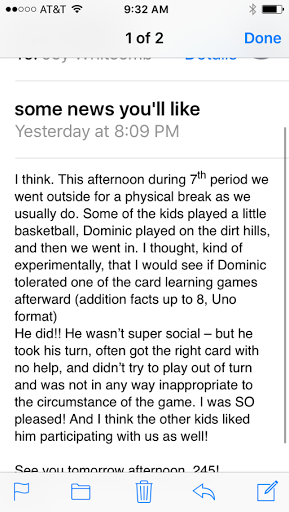 I'm again woefully behind in Dominic updates, I apologize. Life has been ridiculously busy. We did start ioncleanse by AMD footbaths back up on a regular schedule as the undereye circles (liver congestion) are back, and he's been having some skin eruptions. So we'll get those back under control right quick. Given that her biggest concern for Dominic is that he be able to work in a group, follow group instructions, etc - she is over the moon. I'm excited about the potential here too. We are also working on "What day is today" and "What day is tomorrow" and "What city do you live in", which he gets about 50% of the time. I also will throw in asking the dogs names. We are trying to rotate the questions around into random order so that he actually listens to the whole thing before answering. The next biggie we need to do is going to be the home phone number. We are working with Speech Therapy to figure out the best way to get him to learn it.